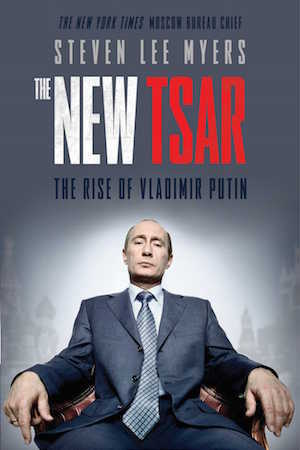 IMR analyst Ezekiel Pfeifer discusses The New Tsar, a perceptive new biography of Vladimir Putin by New York Times reporter Steven Lee Myers that explores the rise of Russia’s modern-day autocrat, from his childhood as a street fighter in Leningrad to his unlikely ascension to the Kremlin throne. The book exhaustively details the milestones of Putin’s life and offers astute analysis of the forces that have shaped him. Russia's president Vladimir Putin (C) addresses the audience at a concert by the Children's Choir of Russia in the State Kremlin Palace. Photo: Alexei Druzhinin / Russian Presidential Press and Information Office / TASS. In June 1996, as St. Petersburg’s glorious white nights kept the city lit around the clock, a former KGB agent and city official named Vladimir Putin suddenly lost his job. His mentor and former employer, the would-be democrat Anatoly Sobchak, had lost the city’s mayoral race a month earlier, after his opponent received the backing of powerful forces in Moscow. Putin, being on the losing side, was told “rather harshly” by the victors to vacate his office. With no clear job prospects, Putin moved with his wife Lyudmila and their two daughters to a dacha 70 miles north of the city, on the shores of Lake Komsomolskoye—part of the now infamous Ozero cooperative, whose members included men who would become billionaires and high-ranking government officials. As Putin waited out the languid days of summer before seeking a job, he and his wife hosted friends at their two-story, 1,600-square-foot house, which had an expansive view of the lake. One day in mid-August, the family of Putin’s former secretary came for a visit, and the men took advantage of the banya (sauna) on the house’s first floor. After taking dive into the cold lake waters, Putin saw smoke—the banya had lit the house on fire. He rushed inside and up the stairs, where he found his former secretary and older daughter, Maria. Putin made a rope from sheets that they used to climb down from a balcony to safety. The house burned down like “a candle,” he recalled later. While the dacha fire likely represents the nadir of Putin’s fortunes in adulthood (as of early 2016, anyway), his beginnings were a grade lower. Born in 1952 to proletarian parents, Putin grew up in Soviet squalor. His father, who escaped the killing fields of World War II after sustaining a leg injury, worked in a factory, entitling the family to a single room in a communal apartment. The formerly exquisite 19th-century building was “infested with rats, which [Putin] and his friends would chase with sticks,” Myers writes. Putin’s childhood travails as an undersized kid with a chip on his shoulder are well known, since he still talks openly about the period. At the annual Valdai gathering in October of last year, Putin said the Leningrad streets had taught him a rule that he applied to the war in Syria: “If a fight is inevitable, you have to strike first.” His proclivity for brawling may later have cost him a valuable promotion at the KGB (although his career surged upward in the end, of course). Putin performed badly in school at first, but not because he wasn’t smart. After reading the famous novel The Shield and the Sword, about a Soviet secret agent in WWII, he decided he wanted to be a spy and became “almost militantly studious.” A KGB officer advised him to study law in order to improve his chances of being recruited, and Putin managed to gain a coveted spot in the law department at Leningrad State University. Upon graduating in summer 1975, he received an invitation to join the notorious security service. He would serve as a KGB officer—although not a secret agent—from that year until the fall of the Soviet Union, when he joined Sobchak’s team in St. Petersburg. Following his years with Sobchak in the mid-1990s, Putin was distant from the halls of power. His prospects seemed dim. And yet, just a few years later, he must have looked like a promising leader to many Russians who wanted to see the government throw off the corrupt leeches that had latched onto the state. Putin’s entrance to Moscow came in late August 1996 when a former colleague, Alexei Kudrin, convinced one of President Boris Yeltsin’s deputy prime ministers to consider him for a job. (Flash forward 19 years and Kudrin, who served as Putin’s finance minister for 11 years, now spends his days critiquing Kremlin policies as the head of a think tank.) Putin got an offer to head the legal department of the Presidential Property Management Directorate, where he monitored the government’s myriad property holdings. Just seven months later, he replaced Kudrin as the head of an agency that served as the Kremlin’s auditor, and the position gave him responsibility for reining in some of the rampant corruption in government. The task was tall—he struggled to land convictions against crooked officials in a legal system where money so easily bought influence. He moved even closer to the levers of power the following year, when Yeltsin appointed him first deputy director of the Kremlin administration, where he handled relations with regional officials. At the time, Putin remained a low-key personality in the Kremlin’s offices at Staraya Ploshchad. In August 1998, an article in the newspaper Moskovskiye Novosti called him “absolutely a backstage person.” But his dogged work ethic and willingness to follow orders earned him accolades from Yeltsin, who called his reports “a model of clarity.” He had for years been a workaholic, often working late into the evenings while at the St. Petersburg mayor’s office and as a mid-level KGB administrator in Dresden, East Germany. (Myers’s depiction of the four-and-a-half years Putin spent abroad—a period that represented the fulfillment of a lifelong dream for Putin in some ways and a deep disappointment in others—is detailed and enlightening.) Then there was his reputation for being incorruptible. Like many Russian officials in the 1990s, he was associated with fraudulent business dealings: lawmakers in St. Petersburg investigated a bungled deal he engineered to export more than $120 million worth of raw materials in exchange for food, through companies run by future Putin associates Vladimir Yakunin and Gennady Timchenko. But, unlike so many other officials, Putin had apparently not enriched himself obscenely. In mid-1998, as tensions built within the Yeltsin government and Yeltsin grew increasingly suspicious of the motives of those working for him, Putin appeared to be a trustworthy candidate for head of the Federal Security Service, the main successor agency to the KGB. In a span of just two years, Putin had been lifted from obscurity into the lofty chair of FSB director. From there, Yeltsin, beset by enemies, moved Putin even higher: head of the Security Council, then prime minister, and finally, on New Year’s Eve 1999, president of Russia. Putin’s rabid work ethic and stellar résumé were not the only things that launched his career, however. The force that elevated his star perhaps more strongly than any other was one of his defining character traits: an intense, almost blind sense of loyalty. The first true object of Putin’s loyalty was the same as it was for many Soviet citizens—the nation. When that nation fell, it tore open a wound in Putin that took decades to heal and left a deep scar. After the initial blow, however, he quickly found a new master to serve: St. Petersburg Mayor Anatoly Sobchak. The charming politician eventually fell from power amid accusations of corrupt behavior, sending many of his allies scurrying, but Putin’s support for him did not diminish. In late 1997, as investigators probed a case against the former mayor, Putin risked his career—and possibly arrest—by whisking Sobchak to Paris on a chartered plane, rescuing him from possible jailing. Putin’s willingness to protect his benefactors, even at significant personal risk, is the characteristic that appeared to sway Yeltsin to choose him as his successor. After all the murky dealings of Yeltsin’s cohorts and the dirty skirmishes among elites, the president wanted to know he would be protected after leaving office. Myers quotes Russian historian Roy Medvedev as saying that Yeltsin was “thinking not so much about holding onto power but guaranteeing his own personal security.” After Yeltsin shocked the nation by resigning at the dawn of the new millennium, handing power over to Putin, the ever-loyal servant issued a decree that made Yeltsin immune from prosecution and granted him a bevy of special privileges. The senses of loyalty and betrayal remain key drivers of Putin’s behavior to this day, especially in his decisions regarding foreign policy and state appointments. Early in his presidency, Putin invested heavily in Russia’s ties with the United States, thinking that U.S. President George W. Bush would work with him to keep warming the countries’ relationship in the wake of the Cold War. Despite a genuine personal connection between the two, Putin felt betrayed by Bush’s refusal to abandon a missile defense plan in Europe, and he disagreed strongly with the invasion of Iraq, a Russian ally. “In his view, [the U.S.] wanted to dictate its terms to the rest of the world, to champion ‘freedom’ and use unilateral means to impose it, to interfere in the internal affairs of other nations,” Myers writes. Meanwhile, many of Putin’s associates who have exhibited loyalty to him have been rewarded lavishly. In a chilling chapter titled “Kremlin, Inc.,” Myers examines the network of lifelong colleagues and close friends who rose to the upper echelons of power together with Putin, such as Rosneft CEO Igor Sechin, Rossia bank owner Yury Kovalchuk, and energy trader Gennady Timchenko. Putin’s legacy is not strictly one of petty slights and corruption, nor does Myers portray it as such. In particular, Putin helped bring stability to the helm of the Russian state after the tumultuous Yeltsin years (although Myers does not overstate his impact in this regard). The trouble is that Putin has become obsessed with stability over the years, reinforcing his deep-seated fear of the crowd and its revolutionary force. That fear, seen especially strongly in his reactions to Ukraine’s 2004 and 2014 revolutions, has become an almost grotesque limitation. Something similar has happened with many of his prominent character traits: his ruthlessness against foes, as seen in his brutal campaign to subdue rebellion in Chechnya and now in Russia’s invasion of Ukraine; his bitterness over the breakup of the Soviet Union and fixation on territorial integrity; his disdain for independent media; his reliance on promoting patriotism to rally political support, in place of meaningful reforms that could threaten entrenched power structures or even his own safety. All these personal tendencies have gradually become dominating state policies. Myers’s richly informed depiction of the events that left their mark on Putin and vice versa—many of them deadly and tragic, such as the Nord Ost and Beslan terror attacks—makes the book enthralling to the end. The suddenness of the change in Putin’s life arc, from a “subaltern” who no one expected could become president to one of the most influential figures in Russian history, is especially fascinating. But for someone who has followed events in Russia closely in recent years, reviewing Putin’s transformation into a paranoid autocrat is also deeply distressing. Having been in the tsar’s throne for so long, Putin has become depressingly predictable. At the recent Valdai conference, Putin repeated his tired lines about U.S. interference in Russia’s affairs, the tragedy of the Soviet collapse, and the dire threat posed by NATO. His script hasn’t changed for years, and it doesn’t appear that it will any time soon. The fact that Putin remains in power makes finishing Myers’s biography bittersweet, since the conclusion is really a middle point. Not only do you want a more decisive finale to the story—you also just want Putin’s time at the top to end.